As we are approaching the Christmas break here at LHSA, the team would like to wish our colleagues, readers and social media followers a Very Merry Christmas and a Happy New Year. We have had another very busy 12 months, but look forward to returning in 2018, when we begin the year participating in the exciting NHS Roadshow! LHSA will be joining the Roadshow, hosted by the People's History of the NHS, at Edinburgh Central Library between 1pm and 4pm on 8th January 2018. This is a chance to see NHS objects over time, learn about hospital histories, share stories and memories of the NHS and much more. You can sign up to the free event on Facebook here. We will be out of the office from 22nd December, returning on 3rd January 2018. Until then, here are a selection of historical festive Christmas cards from various hospitals across Edinburgh. Merry Christmas! This week we say goodbye to our most recent archive intern, Claire. So that’s it; my internship is over. It’s been such a great eight weeks and I feel like I’ve learned so much in my time here. Before I go on to give you a final update on what I’ve been up to I would just like to say a massive thank you to the team here at LHSA. Everyone has been so welcoming, and willing to offer help and guidance and to share their experiences with me, and I hope this isn’t the last time that I get to work with them. In my first ever LHSA blog post, Hello to new intern, Claire!, I talked about the photograph cataloguing project I was going to be working on. The project initially involved working with several series of photographs that are currently catalogued in a legacy system and re-cataloguing them into a new system based on where the photographs came from. I was also tasked with establishing how much material there was and how much housing would be required to house the photographs in a more effective and efficient way. Over the last six weeks or so I have focused mainly on my medical illustrations project, which I completed last week, and listing new donations that the archive has acquired over the last couple of years. This meant that the aim of the photograph cataloguing project changed slightly to describe and rehouse as many groups of photographs as possible in the remaining time. The challenge with this project has been the fact that I knew it wasn’t going to be completed. This meant that I had to approach the task in such a way that I could round my work off when it came to the end of my final week, leaving it in a state that it could easily be picked up by someone in the future, but also in a way that didn’t require any immediate action. The photographs I have been working with are in one of two forms: individually listed, housed and labelled, like the photograph of the Thomas Clouston Clinic below; or bundled together with anywhere from 10 to 50 photographs and negatives in one sleeve. The bundle below is one of the smaller examples. P/PG1/60/B/C/063 – Thomas Clouston Clinic Tower , individually housed. A bundle of photographs and negatives that require re-cataloguing and rehousing. I decided that the best option would be to start with the individually housed and listed photographs as these could be easily transferred, one group at a time, into the new cataloguing system and I could skip the rehousing step if necessary, as the photographs are currently suitably housed. Over the last two weeks I’ve managed to get two series of photographs catalogued into the new system and relabelled with their new identifiers, and I’ve left details of the work I’ve done and decisions I made. Hopefully this is enough for someone else to come along and finish off the project, which would benefit both staff and future researchers. Screenshot of the new catalogue P/PG1/60. Please note that this catalogue is not yet publicly available. When I started my internship with LHSA it was my aim to gain as much experience as I could, in as many aspects of working in an archive as possible. After eight weeks I can safely say that I’ve achieved that: I’ve completed an entire cataloguing project from start to finish; I’ve appraised and listed new accessions; I’ve given a presentation on my work; I’ve learnt basic conservation techniques; I’ve visited other institutions and learnt how they function; I’ve learnt about the cataloguing software I’ve been using; I’ve added to the team’s outreach functions through social media; I’ve contributed to the service’s long-term planning. The list goes on. 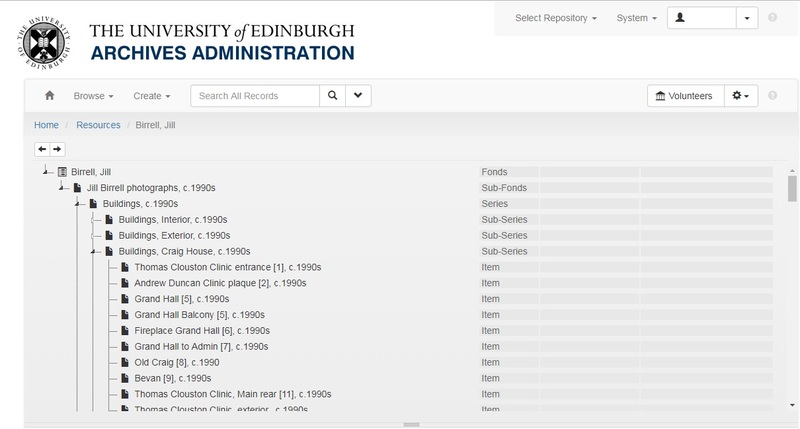 Although it is my aspiration to be an archivist, the next step of my journey takes me back to my records management roots. 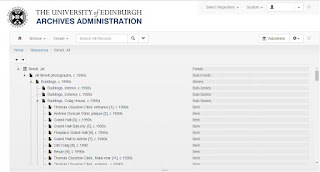 I will be working with Historic Environment Scotland as an Assistant Records Manager and, after all, without good records management archives would be patchy, disorganised and a poor representation of the organisation they recorded. The archival skills and knowledge I have obtained and refined over the last few weeks will be invaluable in my new role and, I hope, will help me immeasurably in the years to come.